How do you take your potential customers’ problems and turn them into a conversion success? If you’re having trouble with low conversion rates on high-traffic landing pages, don’t worry — there’s help. 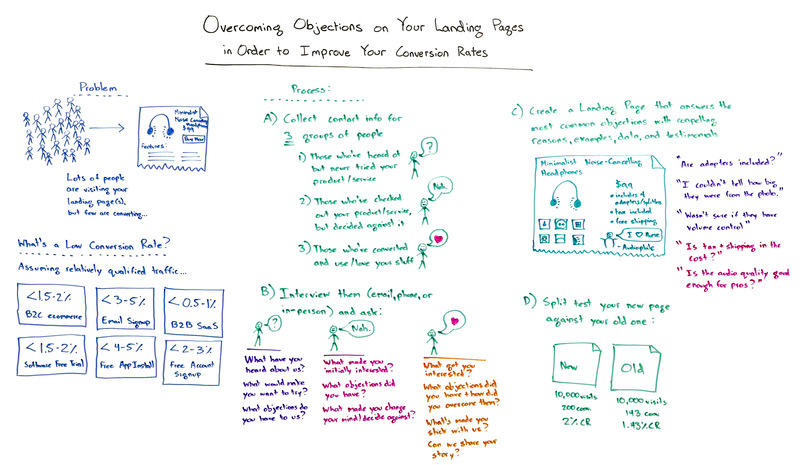 In today’s Whiteboard Friday, Rand shares a process to turn your landing page objections into improved conversion rates. Howdy, Moz fans, and welcome to another edition of Whiteboard Friday. This week we’re going to chat about overcoming objections on your landing pages in order to improve conversion rates. So this a process that I have stolen part and parcel from Conversion Rate Experts, a British consulting company that Moz has used a couple of times to help with our campaigns. Karl Blanks and Ben Jesson have just been phenomenal for this stuff. Look, they’re not the only ones who do it. A lot of people in conversion rate optimization use a process similar to this, but it’s something I talk about and share so often that I thought, hey, let’s bring it to Whiteboard Friday. So a lot of the time marketers have this problem where a lot of people are visiting a page, a landing page where you’re trying to sell someone or get someone to take a conversion action, maybe sign up for an email list or join a community or download an app, take a free trial of something, test out a free tool or buy an actual product, like in this case my minimalist noise-canceling headphones. They are very minimalist indeed thanks to my subpar drawing skills. But when lots of people are visiting this page and very few are converting, you’ve got a conversion rate optimization problem and challenge, and this process can really help you through it. So first off, let’s start with the question around what’s a low conversion rate? The answer to that is it really depends. It depends on who you are and what you’re trying to accomplish. If you’re in business to consumer ecommerce, like selling headphones, then you’re getting what I’d say is relatively qualified traffic. You’re not just blasting traffic to this page that’s coming from sources that maybe don’t even know what they’re getting, but in fact people who clicked here knew that they were looking for headphones. 1.5% to 2%, that’s reasonably solid. Below that you probably have an issue. It’s likely that you can improve it. With email signups, if you’re trying to get people to convert to an email list, 3% to 5% with B2B. Software as a service, it’s a little bit lower, 0.5% to 1%. Those tend to be tougher to get people through. This number might be higher if the B2B product that you’re serving and the SaaS product is a free trial or something like that. In fact, a software free trial usually is in the 1.5% to 2% range. A free app install, like if people are getting to an app download page or to an app’s homepage or download page, and you’re seeing below 4% or 5%, that’s probably a problem. Free account signup, if you’re talking about people joining a community or maybe connecting a Facebook or a Google account to start a free account on a website, that’s maybe in the 2% to 3% range. But these are variable. Your mileage may vary. But I want to say that if you start from these assumptions and you’re looking and you’re going, “Wow, we’re way under these for our target,” yeah, let’s try this process. So what we do to start, and what Conversion Rate Experts did to start, is they collect contact information for three different groups of people. The first group is people who’ve heard of your product, your service, your company, but they’ve never actually tried it. Maybe they haven’t even made their way to a landing page to convert yet, but they’re in your target demographic. They’re the audience you’re trying to reach. The second group is people who have tried out your product or service but decided against it. That could be people who went through the shopping cart but abandoned it, and so you have their email address. It could be people who’ve signed up for an email newsletter but canceled it, or signed up for an account but never kept using it, or signed up for a free trial but canceled before the period was over. It could be people who have signed up for a mailing list to get a product but then never actually converted. Then the third one is people who have converted, people who actually use your stuff, like it, have tried it, bought it, etc. You want to interview them. You can use three methods, and I recommend some combination of all of these. You can do it over email, over the phone, or in person. When we’ve done this specifically in-house for Moz, or when Conversion Rate Experts did it for Moz, they did all three. They interviewed some folks over email, some folks they talked to over the phone, some folks they went to, literally, conferences and events and met with them in person and had those interviews, those sit-down interviews. For people who sort of walked away, they maybe tried or they didn’t get all the way through trying, but they walked away, they didn’t end up converting or they didn’t stick with it, we could say: “What made you initially interested? What objections did you have, and how did you overcome those? What made you change your mind or decide against this product?” Oftentimes that’s a mismatch of expectations versus what was delivered. Then for the people who loved it, who are loyal customers, who are big fans, you can say: “Well, what got you interested? What objections did you have and how did you overcome them? What has made you stick with us? What makes you love us or this product or this service, this newsletter, this account, this community, and if you did love it, can we share your story?” This is powerful because we can use these later on for testimonials. Then C, in this process, we’re going to actually create a landing page that takes the answers to these questions, which are essentially objections, reasons people didn’t buy, didn’t convert or weren’t happy when they did, and we’re going to turn them into a landing page that offers compelling explanations, compelling reasons, examples, data and testimonials to get people through that process. So if you hear, for example, “Hey, I didn’t buy this because I wasn’t sure if the right adapters would be included for my devices,” or, “I travel on planes a lot and I didn’t know whether the headphones would support the plane use that I want to have,” great, terrific. We’re going to include what the adapters are right on there, which airlines they’re compatible with, all that kind of information. That’s going on the page. If they say, “Hey, I actually couldn’t tell how big the headphones were. I know you have dimensions on there, but I couldn’t tell how big they were from the photos,” okay, let’s add some photos of representative sample sizes of things that people are very familiar with, maybe a CD, maybe an iPhone that people are like, “Oh yeah, I know the size of a CD. I know the size of an iPhone. I can compare that against the headphones.” So now that’s one of the images in there. Great, we’ve answered the objection. “I wasn’t sure if they had volume control.” Great. Let’s put that in a photo. “Is the audio quality good enough for audiophiles and pros because I’m really . . .” well, terrific. Let’s find a known audiophile, let’s add their testimonial to the page. We’re essentially going one by one through the objections that we hear most frequently here, and then we’re turning those into content on the page. That content can be data, it can be reasons, it can be examples, it can be testimonials. It’s whatever we needed to be to help get people through that purchase process. Then, of course, with every type of conversion rate optimization test and landing page optimization, we want to actually try some variations. So we’re going to do a split test of the new page against the old one, and if we see there’s stronger conversion rate, we know we’ve had success. If we don’t, we can go back to the drawing board and potentially broaden our audience here, try and understand how have we not overcome these objections, maybe show this new page to some of these people and see what additional objections they’ve got, all that kind of stuff. This process is really powerful. It helps you uncover the problems and issues that you may not even know exist. In my experience, it’s the case that when companies try this, whether it’s for products or for services, for landing pages, for new accounts, for apps, whatever it is, they tend to uncover the same small set of answers from these groups over and over again. It’s just a matter of getting those four or five questions right and answering them on the landing page in order to significantly improve conversion. All right, everyone. Look forward to your suggestions, your ideas, your feedback, and we’ll see you again next week for another edition of Whiteboard Friday. Take care. Asus has settled charges with the FTC alleging that critical security flaws in its routers and cloud services put the home networks of hundreds of thousands of consumers at risk. As part of the settlement agreement, Asus will establish and maintain a comprehensive security program subject to independent audits for the next two decades. Asus drew the FTC’s ire by marketing its routers as having numerous security features that it claimed could “protect computers from any unauthorized access, hacking, and virus attacks,” yet failed to live up to the claims. One of the FTC’s complaints is that Asus didn’t dole out patches quick enough, nor did it sufficiently alert users of its routers of the threats involved when running dated firmware. Even worse, the FTC says that in many cases, the software update tool for Asus’ routers often told consumers that they were running the latest firmware, when in fact newer software with critical software updates as available. The FTC also chastised Asus for allowing customers to retain the same default login credentials on every router with username “admin” and password “admin,” and it took issue with a vulnerability in its AiCloud service that allowed hackers to bypass the login screen and gain compete access to a consumer’s connected storage device without any credentials. Sting like a bee: Analog connection only limits you to the quality of your sound card; ear cups don’t rotate along z-axis. When I first opened the package, I noticed how much the H5 reminded me of the Kingston HyperX Cloud IIs we love. The metal frames that hold the ear cups stood out, as did the removable, bendable mic. If you didn’t know better, you could mistake the headset for the Cloud IIs from a distance. The first thing that’s key to know about the H5 is that this is an analog stereo headset, and doesn’t have any surround capabilities built into it. You can emulate surround in software with Creative’s BlasterX Acoustic Engine software (which you have to register an email address to download), but the H5 itself isn’t billed as a surround headset. Lots of vendors offer surround supplied by software (like Logitech, for example), but since the H5 uses an analog connection, that sound quality will only be as good as your sound card, and won’t show up as a device running its own drivers. On the upside, this also means that the headset will work equally well on Windows, Linux, and your phone. Even though this is a set of stereo cans, they sound damn good, and on par with the Cloud IIs in terms of audio response and quality. The isolation offered by the soft leatherette ear pads are on par with the Logitech G633, and feel much more like a hug on the sides of your head. Ear cup material preference is something that’s highly subjective, but these pads do feel comfortable for long periods of wear. However, the material will lend to a little more sweating for long periods of gaming in warm temperatures. It’s still winter at time of writing, so the pads are quite comfortable. When talking about feel, it’s important to note just how feather-light these cans are. While some may not mind heavier headsets like the Polk Audio Striker Pro, gamers who don’t want to feel the pressure of headset on their noggins for hours will see the H5 as a breath of fresh air. The H5 feels a touch lighter than the G633, without the bulkiness. For portability, both the H5’s mic and cable detach from the headset. The detachable mic and not-so-over-the-top design makes the headset suitable for wear away from your PC as well, so tip of the hat for a street-friendly design. One thing I really like about the headset is the headband; it’s more robust than it looks, springing back into place after we bend it up so that the headband is nearly flat. Creative did this by using steel underneath the padding instead of plastic. While doing this with other headsets often makes me cringe, the H5 happily takes the bending in stride. One thing that seemed to be missing is that the H5’s ear cups don’t rotate along the z-axis. (If you’re holding the headset upright, you can’t twist the cups from left to right.) As someone who used to DJ as a hobby, I have a habit of lifting one ear cup off my ear to listen to someone. A rotating ear cup allows the wearer to do this without adjusting the position of the other ear cup. It’s not a huge omission (and would have added to the headset’s weight), but it’s a feature that both the G633 and Striker Pro have that I would’ve liked to see. All in all, the Creative Sound BlasterX H5 is a great lightweight stereo headset. It’s not much to look at, but for a no-frills set of cans, the H5 gets the job done and doesn’t break your neck doing it. With audio quality that you’d expect from the HyperX Cloud II if you bypassed the USB device and plugged the 3.5mm jack directly into your PC, the H5 is a great headset. At $130, the H5’s price is higher than the Polk Striker Pro P1 ($100), but the H5 delivers great sound in a lightweight package. Creative is one of the oldest players in the game when it comes to sound on the PC. With PC memory companies (Kingston, Corsair) edging in on the audio peripheral market, it’s good to see Creative’s Sound Blaster brand compete in a space that it helped create. I’m pleased with the H5, and we’re looking forward to finding out how the Sound BlasterX H7 (the USB 7.1 surround version) performs.